Available for use by the church & community…. The church building is right in the middle of the village on Walwyn Road about 50 yards along from the post office. It is much bigger than it looks from the front because it goes back a long way! It was built originally for the use of the labourers who built the railway tunnel. We have 2 rooms, the main church hall and at the back there is another large modern room, the Henry Ellis Suite (named after a special person who was part of the church a number of years ago), a toilet and awesome kitchen facilities which were added a few years ago. You are very welcome to come and have a look around if you have never visited us before. 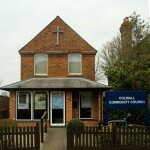 The building is used regularly through the week both by the church and also by other organisations. From pilates to parties. Both rooms are available for hire. Enquiries should be made to Lynne Oliver our Booking Clerk on 01684 541395.